Smashing Pumpkin Is June’s Member of the Month! This month’s member of the month is Smashing Pumpkin. If you know anything about Suburbia Roller Derby, then you know Smashing Pumpkin! She has been with SRD since the beginning — June is her tenth derbyversary — and she has basically done everything in and for the league. Learn more about her below! That’s a very deep question! I am Smashing Pumpkin #1979. I am head of the Coaching & Training committee for Suburbia and captain of the Suburban Brawl, Suburbia’s WFTDA travel team. 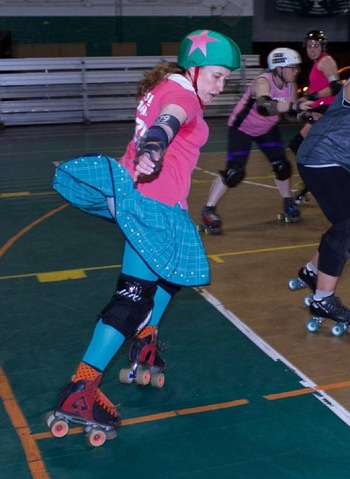 I am a skater on the Country Clubbers (one of our home scrimmage teams) and a founding member of SRD. Actually June is my derbyversary! I have been playing derby for 10 years this month and have been with SRD for 10 years (SRD and I share the same derbyversary). June 2007. SRD didn’t officially become a league until July 2007 but our founders were holding informal practices outside at a disused tennis court in a park in Port Chester in June to gauge interest. I had decided to quit my job and knew that if I didn’t get out of the house and speak to other humans while I looked for new employment I might become a shut in. I also received a message from Suffah Kate on MySpace letting me know they were starting up a league in Westchester. Yes, MySpace, I am that old. They had seen that I listed roller skating as a interest on my profile. All I knew about derby was from seeing a little of “Roller Girls” reality show on A&E. So I showed up with my Chicago skates and gave it a whirl. Wait, I can stop playing? I have been playing so long I don’t remember life without it. I have always enjoyed skating fast and turning left. Landing a really great hit, forcing a cut or jumping an apex successfully is the best rush I know and can certainly wipe away a case of the Mondays. Plus SRD is my quirky little family. I would be so lonely and bored without them. They keep me on my toes. That and I have built my entire identity around “Pumpkin.” I have orange hair, wear lots of orange, drive only orange cars and I am in the process of buying an orange couch. What would become of all my orange possessions? I will be here until I have to go to the roller derby old folks home. That’s a tough one. There are lost of moments in ten years. I did once jump Quadzilla’s leg on the straight away during open scrimmage. Wining MVP blocker at our game against Providence last year was pretty cool since it was my first MVP for a Brawl bout ever and they gave me a little cookie monster doll. Really though I think the fact that I have finally mastered one footed 180’s is making me pretty proud at the moment. They were always my Achilles heel. Philbotomy Is May’s Member of the Month! Sam Handwich Is July’s Member of the Month!